Is it just because of Father’s Day? Or the fact that summer begins officially in less than a week? For whatever reason, cooking with beer outdoors seem particularly prominent of late. You’ll find recipes for grilling with beer at website that promotes Lucy Saunders’ new book (“Grilling with Beer”). And Anheuser-Busch has created recipes for the four beer-based barbecue sauces it will soon be selling. The Grilled Barbecued Brie looks particularly inviting. 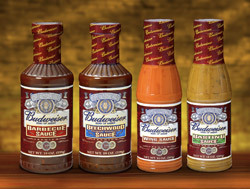 The Budweiser Sauces come in four flavors: Baste, Wing, Barbecue and Beechwood Smoked Barbecue.